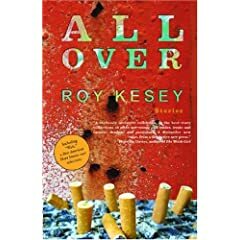 When Dzanc Books picked Roy Kesey's short fiction collection All Over to debut their independent press, I was impressed. I have been reading Roy Kesey's short fiction for years. In McSweeney's, the Land-Grant College Review, or other literary journals, his stories were always the ones that stayed with me. Kesey's unique voice brings these stories to life with an energy level rarely seen in literary fiction. "Even though some of Kesey’s aesthetic choices are frustrating, he constantly demands attention and admiration. Line by line, this book ranks among the best post-postmodern fiction that I’ve read in years. Some people like their sundaes topped with doughnuts. Dig in." My overly dramatic and self-mutilating instincts notwithstanding, I have always loved this song. Particularly when played quietly, when no one else is around, but in a few other contexts too. Quite simply the greatest song ever written about America, and about being buried there, with a car. The greatest thing about this song is that it is its own best argument for a position on any given playlist. The second-greatest thing about it is that even a 16th-century miller from the Friuli (or perhaps especially a 16th-century miller from the Friuli) would jump at the chance to engage with its stance as re: mind v. non-mind. Gatton’s hands looked like they were made for maybe hanging sheetrock. But that’s not what they sounded like, not much at all, and I wish he was still around. I chose this song only partially because Jeff dedicated it to me. Well, perhaps not to me, but definitely to someone with the same name as me. It says so right on the CD cover. There aren’t nearly enough songs in the world about ice cream, but this one takes up most of the slack. Turns out that in the right hands, bluegrass knows what China is all about. This may have been a case (and if so, it was the only one) where a song was relating itself to a story in All Over while my head was in the act of actually writing said story. I say ‘may have been’ because I don’t really remember, but it seems likely, seems like a punch line worth reaching for. I sometimes forget why people would ever talk or sing about Light, but with this song I remember for a while. He was mostly blind for a time, and wrote this song. I’m still not sure how something so complicated can be so gentle. Yeah, I know. But still, right? Okay, so if background undulations = silent questions, then maybe melismatic melody = noisy answers? It’s not at all clear whether Coltrane is ever going to find his way out. But then he does. 14. The adagio that is the middle third of Dvořák’s Cello Concerto in B minor. Yup, every bit of it. At any given moment, the easiest way to cheer up is to realize that no matter how depressed you are, Leonard Cohen is even more depressed, and is getting good material out of it. This song does not seem like the kind of thing that could ever happen in proximity to a banjo, and yet it does. There’s no way a song like this should be able to survive any sort of translation at all, but I’ve heard maybe twenty versions and liked almost all of them. Even the salsa version. Really! Ne me salsa pas, and still I mist up. And at last we come to the money shot, the specifically-written-for song, one of the forty-four tracks that accompany the pieces in Issue 6 of Timothy McSweeney’s Quarterly Concern. This is the song (the whole album, really) that announced the end of each workday throughout the writing of the final draft of All Over: my kids, fresh home from preschool, have put the CD on, and it is now time to dance, and dance we shall, madly.